Abstract: The chemistry of detrital garnets (almandine; spessartine-, grossular-, and pyrope-rich almandine; andradite) and mostly dravitic tourmalines from three sandstone samples of the Permian Malužiná Formation in the northern part of the Malé Karpaty Mts (Western Carpathians, SW Slovakia) reveals a great variability of potential source rocks. They comprise (1) low-grade regionally metamorphosed rocks (metacherts, blue schists, metapelites and metapsammites), (2) contact-thermal metamorphic calcareous rocks (skarns or rodingites), (3) garnet-bearing mica schists and gneisses resulting from the regional metamorphism of argillaceous sediments, (4) amphibolites and metabasic sub-ophiolitic rocks, (5) granulites, (6) Li-poor granites and their associated pegmatites and aplites as well as (7) rhyolites. Consequently, the post-Variscan, rift-related sedimentary basin of the Malužiná Formation originated in the vicinity of a low- to high-grade crystalline basement with granitic rocks. 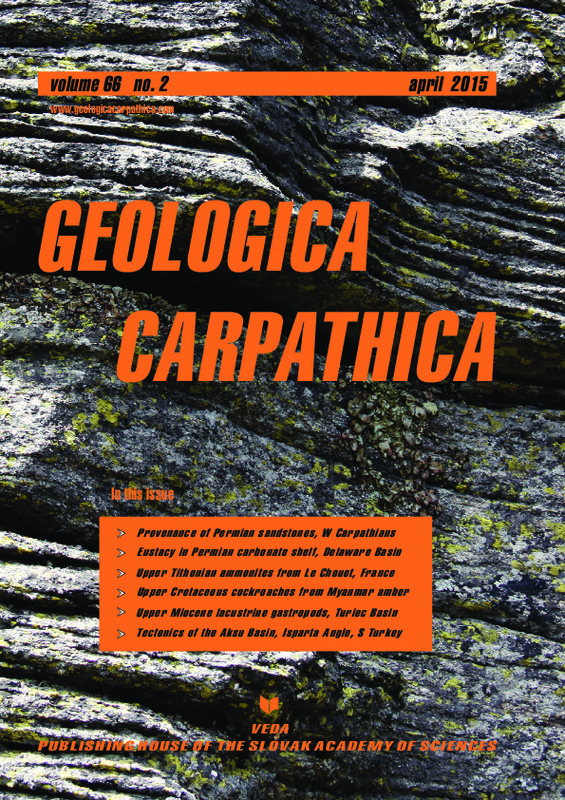 Such lithological types of metamorphic and magmatic rocks are characteristic for the Variscan terranes of the Central Western Carpathians (Tatricum and Veporicum Superunits). Abstract: This contribution focuses on the late Tithonian ammonite faunas belonging to the Family Himalayitidae Spath in the key-section of Le Chouet (Drôme, France). The great majority of specimens from the Mediterranean Tethys, previously referred to Durangites Burckhardt, are now interpreted as juveniles and/or microconchs of the highly variable species Protacanthodiscus andreaei (Kilian). Moreover, comparison between specimens from France, Spain and Bulgaria formerly assigned to Durangites astillerensis Imlay and the type material of this species, supports the introduction of Boughdiriella chouetensis gen. nov. et sp. nov. Further, the revision of the type specimens of D. astillerensis and Durangites of the D. vulgaris group shows that the former species deserves a new generic status, for which Parrasiella gen. nov. is erected. Toucasiella, previously only known from Spain and Tunisia, is also reported for the first time from south east France. The revision of the “Mediterranean Durangites” supports the rejection of a Durangites spp. Zone as part of the standard zonation for the upper Tithonian, and its replacement by the P. andreaei Zone ( = D. vulgaris Zone sensu Sarti, 1988). Abstract: We describe a new extinct lineage Manipulatoridae (new family) of cockroaches from the Upper Cretaceous (Cenomanian) amber of Myanmar. Manipulator modificaputis gen. et sp. n. is a morphologically unique extinct cockroach that represents the first (of a total of 29 known worldwide) cockroach family reported exclusively from the Myanmar amber. This family represents an early side branch of the stem group of Mantodea (most probably a sister group of Eadiidae within Blattaria/Corydioidea) because it has some synapomorphies with the Mantodea (including the stem group and Eadiidae). This family also retains symplesiomorphies that exclude a position in the crown group, and furthermore has unique autapomorphies that exclude a position as a direct ancestor of Mantodea. The unique adaptations such as strongly elongated extremities and freely movable head on a long neck suggest that these animals were pursuit predators. Five additional specimens (including two immatures) reported from the Myanmar amber suggest that this group was relatively rare but belonged to the indigenous and autochthonous inhabitants of the ancient amber forest of the Myanmar region. Abstract: The present work displays the first detailed taxonomic study on the freshwater gastropod fauna of the Upper Miocene Lake Turiec. Apart from several mentions of species and genus names in the literature, the mollusc fauna has been poorly studied up to now. Some of the cited genera implied peculiar paleobiogeographic relationships, urging a taxonomic investigation to either prove or revise such arising claims. Variable degrees of preservation, however, lim- ited the possibility to identify all the fossils at species level. The fauna includes at least ten species, of which five turned out to be new to science. Four of those were sufficiently well preserved to be described as new species, namely Viviparus pipiki Neubauer & Harzhauser nov. sp., Melanopsis glaubrechti Neubauer & Harzhauser nov. sp., Tournouerina turiecensis Neubauer & Harzhauser nov. sp., and Radix kovaci Neubauer & Harzhauser nov. sp. Additionally, the new genus Popovicia Neubauer & Harzhauser nov. gen. is introduced for the primary homonym Metohia Popović, 1964 non Absolon, 1927. Most importantly, this taxonomic study revises many of the names cited in the literature and proves most of the alleged paleobiogeographic relationships wrong. The only biogeographic and stratigraphic surprise is the record of Popovicia cf. compressa, a species described from lower Pliocene deposits of the Metohia Basin in Kosovo. The majority of the fauna, however, has only been documented for the Turiec Basin, once more confirming the high degree of its endemicity. The faunal relationships indicate a latest Middle to early Late Pannonian (Middle to Late Tortonian) age, which is in agreement with available age models. Abstract: The Aksu Basin, within the Isparta Angle, is located to the north of the intersection of the Aegean and Cyprus arcs and has been evolving since the Middle Miocene. Correlation of: (1) kinematic analysis of fault planes that cut the basin fill, (2) the reactivation/inversion of fault planes and (3) sedimentological data indicate that the Aksu Basin has evolved by four alternating compressional and extensional tectonic phases since its formation. The first phase was NW-SE oriented compression caused by the emplacement of the Lycian Nappe units which ended in Langhian. This compres- sional phase that induced the formation and the initial deformation of the basin was followed by a NW-SE extensional phase. This tectonic phase prevailed between the Langhian and Messinian and was terminated by a NE-SW compres- sional regime known as the Aksu Phase. The neotectonic period is characterized by NE-SW extension and began in the Late Pliocene. Correlation with the existing tectonic literature shows that the order of deformational phases proposed in this study might also be valid for the entire Isparta Angle area.